The HP Officejet 6600 e-All-in-One Printer color inkjet multifunction (copy/scan/print/fax) is a puzzler, and a huge disappointment. Priced at $150 (as of June 11, 2012), it's handsome, it has an easy-to-use LCD control panel, and it offers excellent performance as well as decent output. However, for some bizarre reason HP has removed manual duplexing support--a simple software feature that allows relatively easy two-sided printing on printers that lack an automatic duplexer--from the printer driver. HP has also removed multi-up (thumbnail pages) and every other kind of layout from the print driver. Such features are so commonplace that many consumers just assume that they are available. Put simply: $150 for a multifunction that won't help you print two-sided to save paper? I think not. For the same amount, you can buy a unit with automatic duplexing. Still reading? The Officejet 6600 would be a nice midvolume office unit if not for the stunted driver. It has a 250-sheet input tray, a 75-sheet output tray, and a 35-sheet automatic document feeder for the A4/letter-size scanner. Despite the ADF, though, I found no option in the control panel to scan or copy in duplex. The Officejet 6600's LCD is an odd duck, but ultimately it is satisfying. It's not a touchscreen, but a press-screen (resistive): You must depress the covering lightly, as you would with a membrane keyboard, to register selections. Once you get used to it, the tactile feedback is pleasing. Other than the hobbled driver, the HP-provided software is quite good. It supports push-scanning (scanning from the control panel to a PC), as well as printing across the Internet via the company's ePrint service. In our tests, text output from the Officejet 6600 was very nice--black and sharp. Photos printed to plain paper had a washed-out appearance. Glossy-paper photos exhibited a high level of contrast, which applied a slightly unrealistic cast to human faces; however, at least for nonhuman subjects, the high contrast evoked a sense of impact. The Officejet 6600 is a good performer. In our tests, monochrome pages printed at 10 pages per minute on the PC and 9.6 ppm on the Mac. Snapshot-size (4-by-6-inch) photos printed to plain paper at 3.4 ppm and to glossy paper at about 1 ppm. Full page photos printed at 0.4 ppm, and copies exited quickly at 5.1 ppm. 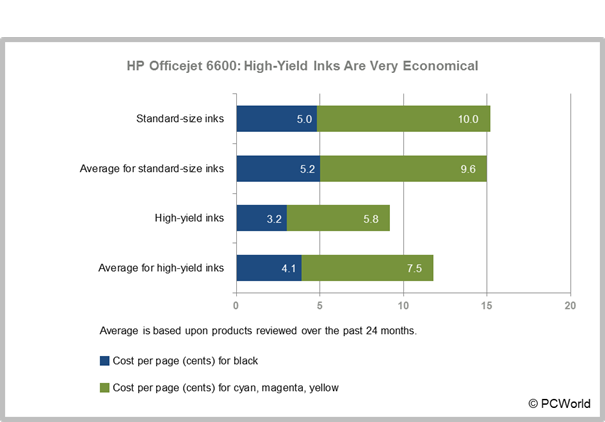 As for consumables, the Officejet 6600 uses a four-cartridge ink system (cyan, magenta, yellow, black) that's basically average in cost with the regular-capacity supplies, but cheaper than most printers in this class when using the high-capacity cartridges. The regular, $20 black cartridge lasts for 400 pages, for a slightly below-average cost of 5 cents per page. The $11 cyan, magenta, and yellow cartridges each last for 330 pages, working out to 3.3 cents per page, per color. Add all of that up, and you get a slightly pricey 15 cents for a four-color page. The $32 XL black, on the other hand, lasts for 1000 pages (3.2 cents per page), and the $16 XL color cartridges each last for 825 pages (1.9 cents per page, per color). Nine cents for a four-color page is quite inexpensive. The unit ships with starter-size cartridges, which are the regular-size cartridges with some extra ink slated for use during the initialization process. Despite good performance and cheap high-capacity supplies, a $150 multifunction without any sort of duplexing support should be avoided (unless you actually want to double your paper usage, mailing costs, storage space, and such). Instead, choose a like-priced competitor, such as the Canon Pixma MX512 or the Brother MFC-J825DW. A complete lack of support for two-sided printing is a deal-killer for this otherwise competent small-office multifunction.